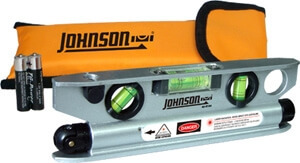 The 40-6164 laser torpedo level is built construction "job site tough" with a solid frame that has some nice weight to it. The laser torpedo level is manually leveling with an accuracy of +/- 1/8" at 50 feet and an interior range of up to 100 feet. The torpedo laser level frame is magnetic and works perfectly for the plumber or electrician, where long accurate runs are critical. All Johnson's laser levels come with a 3-year no hassle laser level warranty and a 24-hour repair or replacement service.